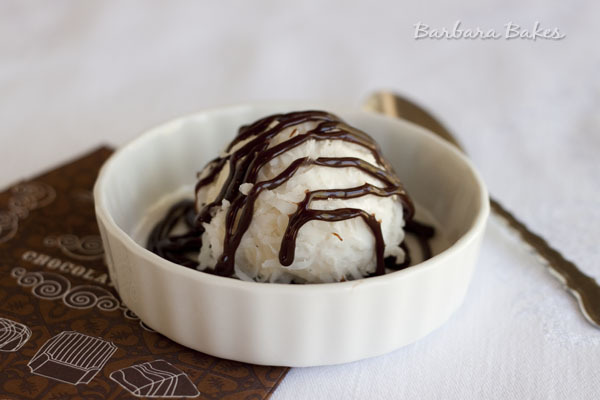 Vanilla ice cream “snowballs” rolled in shredded coconut and served in a puddle of hot fudge. A fun way to dress up ice cream and beat the summer heat. When I was a little girl, my mom made Snowballs for a church party. It seemed like she made hundreds of them and stored them in the big freezer in the basement. They were off limits until the party, which made them even more irresistible. This is such an easy dessert idea. You could make the snowballs with any flavor of ice cream and roll them in your favorite candy or nuts. 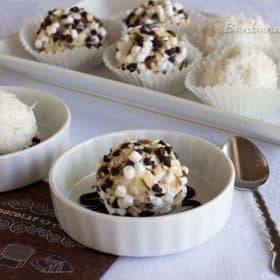 In addition to coconut snowballs, I made Rocky Road Snowballs that my boys especially loved. It would be fun to create an ice cream snowball bar and let guests make their own snowballs any way they want them. The possibility are endless. Make 12 snowballs and place each snowball on the baking sheet in the freezer. Freeze until solid about one hour. Put the coconut in a pie plate. 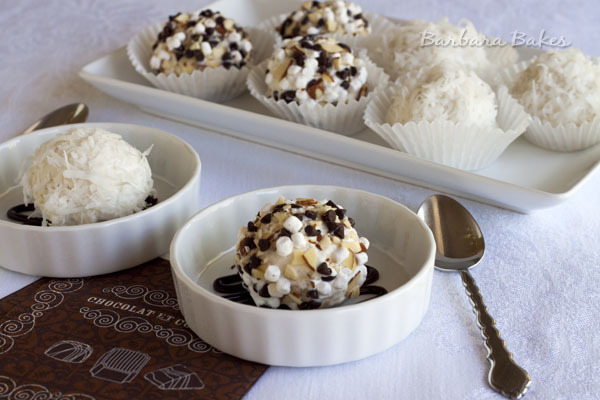 One at a time, roll the ice cream balls in coconut. Gently press coconut into the ice cream. Return the snowball to the baking sheet in the freezer. When all the snowballs have been decorated you can serve immediately or store in the freezer covered for one week. If desired, serve with your favorite ice cream topping. This and other Cool Treats to Beat the Heat recipes are featured in the beautiful new summer edition of Foodie Crush Online Magainze. We love these at our house! We always make them around Christmas time. 🙂 It was so lovely to meet you this past weekend at EVO. Ice creams have been an all time favorite of kids. But as adults I just cannot get enough of it. Your picture is just heavenly, kudos to the art of presentation just like the post. I LOVE these! When I was a little girl, you could buy snowballs with a fake piece of holy and a candle in them at Christmas. A few years ago, Raleys sold them minus the candle but discontinued them. I was going to make them last Christmas to serve with my Buche de Noel, but time got away. I was going to scoop the ice cream and then give them a thin shell of white chocolate before I rolled them in coconut. I even bought the fake holly. Next Christmas! Love this idea!! Definitely want to use this in a party sometime! What a great idea! You could even make little edible snow men out of them! These are just adorable, Barbara! What a fun summer treat. You have really turned ice cream into something special here, Barbara, and I love that the balls can be made ahead of time and stored in the freezer. I love coconut so this recipe has my name on it.